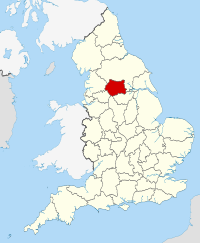 West Yorkshire is a metropolitan county within the Yorkshire and the Humber region of England with a population of 2.2 million. 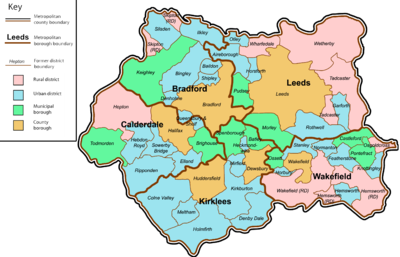 West Yorkshire came into existence as a metropolitan county in 1974 after the passage of the Local Government Act 1972. 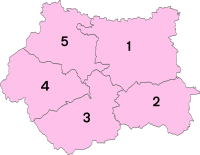 West Yorkshire County Council was abolished in 1986, and so its districts (the metropolitan boroughs) are now effectively unitary authorities. However, the metropolitan county, which covers an area of 2,029 square kilometres (783 sq mi), continues to exist in law, and as a geographic frame of reference. Since 1 April 2014 West Yorkshire has been a combined authority area, with the local authorities pooling together some functions over transport and regeneration as the West Yorkshire Combined Authority. West Yorkshire includes the West Yorkshire Urban Area, which is the most built-up and biggest urban area within the historic county boundaries of Yorkshire. The county initially had a two-tier structure of local government with a strategic-level county council and five districts providing most services. In 1986, throughout England the metropolitan county councils were abolished. The functions of the county council were devolved to the boroughs; joint-boards covering fire, police and public transport; and to other special joint arrangements. Organisations such as West Yorkshire Police Authority and West Yorkshire Passenger Transport Executive continue to operate on this basis. The county borders, going anticlockwise from the west: Lancashire, Greater Manchester, Derbyshire, South Yorkshire and North Yorkshire. It lies almost entirely on rocks of carboniferous age which form the southern Pennine fringes in the west and the Yorkshire coalfield further eastwards. In the extreme east of the metropolitan county there are younger deposits of magnesian limestone. The Bradford and Calderdale areas are dominated by the scenery of the eastern slopes of the Pennines, dropping from upland in the west down to the east, and dissected by numerous steep-sided valleys. There is a close conjunction of large scale industry, urban areas and transport routes with open countryside. The dense network of roads, canals and railways and urban development, confined by valleys creates dramatic interplay of views between settlements and the surrounding hillsides. West Yorkshire has an Oceanic climate, similar to almost all the United Kingdom. West Yorkshire tends to be cooler than counties further south, due to the inland location and high elevation (especially in the west of the county), and snow is common, as are sub-zero temperatures. In December 2010, many rivers in West Yorkshire froze over, such as the River Wharfe and River Aire. Temperatures vary throughout the year, often sometimes reaching 30 °C (86 °F), and in winter temperatures have been reported to fall as low as −16 °C (3 °F) (as in December 2010), but in general they remain between −1 °C (30 °F) and 20 °C (68 °F) all year. In Parliament, 15 out of 23 of West Yorkshire's M.P.s are Labour, 6 are Conservative and 2 are Liberal Democrats. At local level, the councils are generally divided, apart from the Wakefield district, which has long been one of the safest Labour councils in the country. There are currently plans for a tram system in West Yorkshire, but those for a Leeds Supertram were rejected by the government in 2005. Certain services are provided across the county by West Yorkshire Joint Services, and the West Yorkshire Police and West Yorkshire Fire and Rescue Service are also county-wide. The local authorities will pool together some functions over transport, economic development and regeneration as the West Yorkshire Combined Authority from 1 April 2014. West Yorkshire lies in arguably the most strategic part of Yorkshire: the M62, M1 and the A1(M) pass through the county, as well as the internal urban motorways in Leeds and Bradford. West Yorkshire has two mainline railway stations, Leeds and Wakefield Westgate. Leeds railway station is the only Network Rail principal station in Yorkshire and North East England, and one of only three in the North of England along with Manchester Piccadilly and Liverpool Lime Street. Other important railway stations in West Yorkshire include Bradford Interchange, Bradford Forster Square, Huddersfield, Halifax, Dewsbury, Keighley and Shipley. West Yorkshire also has Yorkshire's largest airport, Leeds Bradford International Airport. Unlike South Yorkshire, West Yorkshire has no light transit system; the Leeds Supertram was proposed, but was later cancelled after the withdrawal of government funding; the Leeds Trolleybus is the current proposed scheme. Public transport is run under the authority of the West Yorkshire Passenger Transport Executive (Metro). ^ Office for National Statistics – Gazetteer of the old and new geographies of the United Kingdom, p. 48. Retrieved 14 December 2006. ^ Metropolitan Counties and Districts, Beginners' Guide to UK Geography, Office for National Statistics, 17 September 2004. Retrieved 11 January 2007. ^ Yorkshire and Humber Counties, The Boundary Commission for England. Retrieved 14 February 2007. ^ Wakefield City Council (20 November 2004). "County Hall". http://www.wakefield.gov.uk/CultureAndLeisure/HistoricWakefield/Highlights/Buildings/CountyHall/default.htm. ^ "History of City Hall". City of Bradford Metropolitan District Council. http://www.bradford.gov.uk/leisure_and_culture/hobbies_and_interests/history_of_city_hall.htm. Retrieved 17 January 2009. ^ "Yorkshire Southern Pennine Fringe". www.countryside.gov.uk. http://www.countryside.gov.uk/LAR/Landscape/CC/yorkshire_and_the_humber/yorkshire_southern_pennine_fringe.asp. Retrieved 6 October 2008. ^ "Nottinghamshire, Derbyshire and Yorkshire Coalfield". www.countryside.gov.uk. http://www.countryside.gov.uk/LAR/Landscape/CC/yorkshire_and_the_humber/nottinghamshire_derbyshire_and_yorkshire_coalfield.asp. Retrieved 6 October 2008. ^ "Southern Magnesian Limestone". www.countryside.gov.uk. http://www.countryside.gov.uk/LAR/Landscape/CC/yorkshire_and_the_humber/southern_magnesian_limestone.asp. Retrieved 6 October 2008. ^ "Leeds average weather data.". www.worldtravels.com. http://wunderground.com. Retrieved 14 November 2010. ^ "Regional Gross Value Added" (PDF). Office for National Statistics. 21 December 2005. pp. 240–253. http://www.statistics.gov.uk/downloads/theme_economy/RegionalGVA.pdf. Retrieved 6 October 2008. This page uses content from the English language Wikipedia. The original content was at West Yorkshire. The list of authors can be seen in the page history. As with this Familypedia wiki, the content of Wikipedia is available under the Creative Commons License.